To create vitality and excitement to the cultural heart of Coney Island. Fostering enjoyment of expression of art, music, our universal language, bringing people of different communities and ethnicities closer to harmony and order and molding and blending together and keeping in mind that the education of all ages and love for the arts will keep humanity alive. In 2010 we decided to take our mission to areas beyond its Coney Island roots: to Europe, to Asia! We have therefore joined forces with Culture Gateway, an organization that has much sympathy and experience with our ideals on a world wide canvas. The world is indeed now our oyster. To interview, to write about, to video organizations and performing artists; to publicize in a professional format; to cast, to produce, to educate, to perform with dancers, actors, singers, musicians standard and classical pieces for all in our community and the communities we visit. We were incorporated in 2005 with 501(c)(3) tax status. Our first concert was a sold out performance filled with singers, musicians and kids. 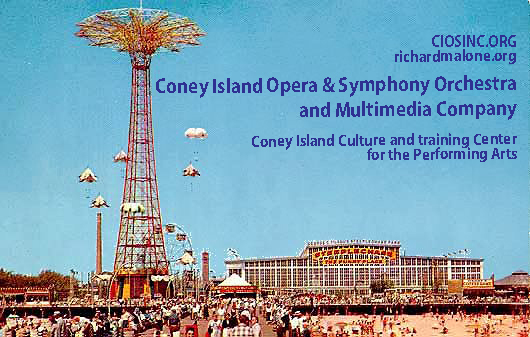 We used Richard Malone's residence as the Coney Island Cultural and Training Center for the Performing Arts.